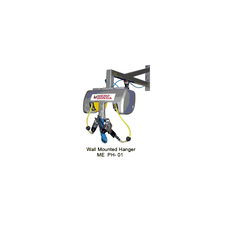 To meet the contemporary trends of hangers, we manufacture and supply Pneumatic Wall Hanger. This exclusively designed hanger is available in different specifications and is manufactured by our experts using premium quality raw material and cutting-edge technology. 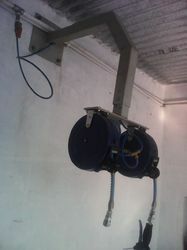 The offered hanger is mainly used in the automobile industry. • Made of M.S frame . • Inbuilt pneumatic line for nut runner & air blow gun . • Inline FRL for removing moisture & set the Air pressure . • Horizontal 180degree rotation . We are providing different kinds of Auto Garage Equipment to our customers’. These are developed from top notch techniques and fine materials. Further, these are known for sturdy construction, long service lives and maximum usage. We customize and pack them with the help of fine quality materials and charge industry leading rates. As per the altering requisites of our clients, we are highly engrossed in the realm of offering to our patrons a comprehensive consignment of Pneumatic Hanger and Hose Reel. We are identified as one of the leading names in the market engaged in providing a wide range of Pneumatic Hanger with Lubricator to our valued clients. We are ranked amongst the most trusted firms deeply engaged in offering a wide range of Pneumatic Hanger. We are one of the leading names in the market, trusted for offering Tool Hanger. Backed by a rich industrial experience, we have come up with a world class Pneumatic Hangers. With an objective to fulfill the ever-evolving demands of our clients, we are engaged in offering a wide assortment of Pneumatic Hanger. Our company has a broad variety of Mayo Safety Pin to the clients. This product is widely used for variety of surgeries in the health care industry. This product is specially designed for easy application and removal.